Fancy Dress Worldwide was first founded in March 2016, and has continued to grow as the years go by. From Fancy Fresher to Fancy Dress Worldwide - Dom Portman takes fancy dress from 1 to 60 countries! The full length of the England Flag bunting is 6m /20ft (approx). Total Length: 6m / 20ft (approx). 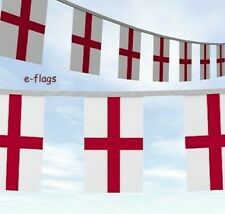 ENGLAND FLAG PARTY BUNTING. For any British celebration. Used but in great condition. Nearly 10m long which is approx 32 foot. Each flag is 23cm wide and there are 22 flags. Any questions please ask. 4 BRASS EYELETS FOR EASY HANGING 1 IN EACH CORNER. WILL BRIGHTEN UP & TRANSFORM ANY WALL SPACE. 100% POLYESTER FLAG MATERIAL. MACHINE WASHABLE UP TO 40c / DRIP DRY. Union Jack Bunting. Cloth Binding and Ties (not plastic) Very strong. ☆ Key Promotions ☆. Made from 100% woven polyester. Product View. Perfect for parties and sporting events. Support England, celebrate England. Now they go into the Nations league. Measures 77 x 24cm - Double sided design (picture shows each side, this is for 1 banner only). Material: Polyester Triangle Bunting. Size: 20 X 12" X 9" FLAGS. We will be glad to reply and help you to solve any problem. With a wide range, good quality, reasonable prices and stylish designs. England FA 'Goal' Fan Banners x 40. Reversible: 1 side says 'England', 1 side says 'GOAL'. Ideal for any England supporter. Great Range on Kids Bedding, Duvet Sets, Toddler Beds, Curtains, Toys, Wallpaper, Borders and many more Childrens bedroom accessories.